The Spa Delights gift basket will delight that special lady with baths oils, lotions and gels as well as scented drawer sachets that will keep both her and her special things smelling delightful long after the spa is over! Assorted white and raspberry chocolates complete the surprises to be found in this white picket fence planter. 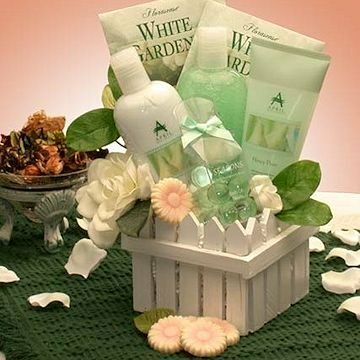 Delight her with the Spa Delights gift basket. This gift includes the following: 8 oz Heavenly Moments Moisturizing Body Lotion, 8 oz Heavenly Moments, Moisturizing Bath & Body Gel, 8 oz Heavenly Moments Invigorating Body Spray, Bath Oil Beads/ or Bath Salts, 2 Scented Drawer Sachets, Ghirardelli Asst Chocolate Squares qty 4, White Picket Fence Planter 5"x5"x5".